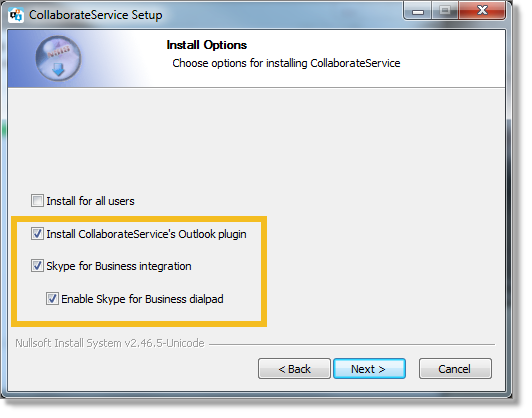 When you install the AT&T CollaborateSM desktop app for Microsoft Windows®, you can select options to install add-ins for Microsoft Outlook® and Skype® for Business. The Windows desktop app integrates with Skype for Business. You can use Collaborate for non-Skype calls, such as calls to mobile devices, while presence, chat, and Skype-to-Skype calls still take place through Skype. You can use Collaborate call control features, such as Hang Up, Mute, Transfer, Conference, and Call Park. Collaborate updates your phone presence in Skype. The Microsoft Outlook add-in for Desktop provides integration between Desktop and Outlook.